Six Years of Fighting Against Samsung Turns Father Into Labor Advocate: An Interview With Hwang Sang-ki | Stop Samsung - No More Deaths! Hwang Sang-ki, 58 years old, began to take on Samsung six years ago, after losing her daughter Yumi to occupationally caused leukemia at the world’s largest tech company. Six years ago, on March 6, 2007, Hwang Yumi died in her father’s taxi on her way to hospital. Yumi was only 23 years old. It was five years after she began to work as an operator at Samsung Electronics Co., Ltd. in the city of Suwan. And it was 20 months after she was diagnosed with acute myelogenous leukemia. The death of a daughter changed the life of her father. Since her death, Hwang Sang-ki, a taxi driver of modest means, did everything he could to get the tragic story of her daughter out in a country where the world’s largest semiconductor maker’s political and economic tentacles reach to every corner. Samsung attempted to suppress the father’s voice with hush money and blackmail. Six years after losing his daughter Hwang Yumi to Leukemia, Hwang Sang-ki still splits his time between Seoul and his hometown Sokcho. In the past six years, no rally against Samsung and its occupational disease cluster has taken place without his presence. “I am making a living driving a taxi in Sokcho. Splitting time between the two cities is really hectic,” Hwang told the reporter. March 6th marks the sixth anniversary of Yumi’s death. The entire six years also represented the time he spent fighting to get his daughter’s death legally recognized as the result of occupational hazards. It took six years after her death–and four years after his court petition to win a lower court ruling that workers compensation for Yumi’s death should be granted—something Samsung has been denying and the Korea Workers Compensation & Welfare Service (KCOMWEL), the regulatory body, had been fighting. This is not the end of the story. Hwang may spend more years in court as high court, and Supreme Court, proceedings are still ahead of him. It was June 2005 when Yumi was diagnosed with acute myelogenous leukemia. She was 21 years old. She developed the condition though there was no family history of the rare disease. It had been only 20 months after she began to work as an operator at the Kihung plant of Samsung. In December 2005 when Yumi’s condition took a brief favorable turn after bone marrow transplants, Hwang learned of words that 30-year-old Yi Sook-young, a Samsung employee who worked alongside Yumi, died of leukemia. That confirmed his belief that her daughter’s disease was the result of occupational hazards. It was hardly a coincidence that the two co-workers developed the rare type of leukemia, which was found in only 4.2 out of the 100,000 people aged 20 to 29 nationally. Instead of approving her disease as an industrial accident, Samsung demanded Yumi’s resignation. In mid-November 2006, after the blank “letter of resignation”, Yumi’s condition grew worse. The manager who picked up the resignation letter visited Hwang again, now with the KRW 5 million. He said the KRW 5 million was all he could offer and demanded that Hwang accept it. Hwang began to look for former Samsung employees who had developed leukemia. By word of mouth, he found six victims. Meanwhile, Samsung maintained that Yumi, having resigned, had nothing with the company any longer. On March 6, 2007, Yumi died. Hwang in vain resorted to elected officials, broadcasters–and indeed every possible place and people he could think of– regarding the working conditions that led to Yumi’s death. Finally, in June 2007, Uri Suwon, a small local newspaper, ran a report on Yumi’s death based on the journal she kept while working at her plant. In the same month, aided by labor advocacy groups, Hwang filed a petition with KCOMWEL for workers compensation. It was not an easy process. On Sept. 1, 2007, Samsung conducted an epidemiologic probe of the plant. Hwang said of the probe as a sham. The probe should have been conducted, unannounced. However, the company knew the schedule and had enough time to prepare for it. “My daughter said she worked in a poorly ventilated room that was not compartmentalized. By the time they conducted the investigation, the factory was well-ventilated and cool, and separate areas were installed,” said Hwang. After the epidemiologic investigation, a Samsung manager promised him KRW 1 billion (U$922,000) on the condition that he would stop contacting labor advocacy groups and publicly talking about the death of her daughter. 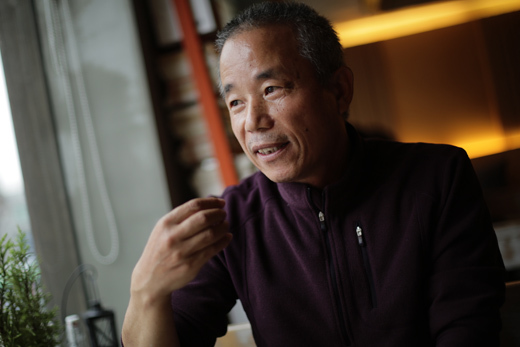 After Hwang’s efforts, on Nov. 11, 2007, about 20 labor and civic groups banded together and formed SHARPS. More victims came out. In May 2009, two years after receiving the petition, KCOMWEL turned it down. In Jan. 2010, Hwang and four other Samsung workers who developed leukemia and other types of blood disease joined forces to bring an administrative lawsuit against KCOMWEL for denying their earlier petitions. Samsung, named as a party liable to the defendant in the lawsuit, hired six lawyers from big law firms to argue the case. On June 23, 2011, the court ruled in favor of Yumi and two other victims. It took yet another four years to score a legal victory after KCOMWEL’s rejections. Boosted by Hwang’s triumph, more victims came forward. According to SHARPS, as of date, 200 workers once employed in the electronics industry have stepped forward. The organization had profiled 80 deceased workers. Feb. 2011, the ministry of employment and labor finally confirmed that carcinogenic materials such as benzene, formaldehyde, and arsenic trioxide, as well as ionizing radiation, were in use at Samsung and other semiconductor makers. In April and December of the same year, two former Samsung employees’ petitions for workers compensation claims were granted by KCOMWEL. The two women respectively suffered breast cancer and aplastic anemia. In addition to Hwang’s victory, the two female workers’ cases were one of the greatest accomplishments by SHARPS. The number of workplace safety violations turned up South Korea’s ministry of employment and labor in a probe that followed the fatal chemical leaks of Jan. 28-29. KRW250 million, or $2.3 million, was the amount of penalties levied on Samsung by the ministry over the chemical leaks that killed one contract workers and injured four others. The Samsung Suwon plant, where the fatal leaks took place, had only one full-time safety officer. According to the March 3, 2013 The Financial Times, Samsung denies all claims of child labor in China and other illegal labor practices after being sued by three French human rights groups. The suit accuses Samsung of deceiving consumers by violating its own promises on ethical working conditions and of using child labor. Samsung admitted breaches of certain regulations as its Chinese contractors such as excessive working hours. The company promised to end this practice by the end of 2014. The number of workers who SHAPRS has profiled that have developed various types of blood disorder while employed at Samsung or its subsidiaries as of Feb. 2013. Out of the 181 injured workers, 69 have died as of Feb. 2013. The age of the youngest victim is 19. The female worker, known by her last name Choi outside SHARPS because her family does not want her identity released, died of a blood disorder in 1995, a year after she began to work at the Kihung plant. The age of the oldest victim is 46. Yun Jae-hyon, a male, began to work at Samsung’s LCD plant in 1989 and died of brain tumors in 2007. In total, 35 female and 34 male victims have died. Hwang’s tiny victory came after many twists and turns. “When I first attempted to get the story of my daughter out, journalists and lawmakers looked the other way. Many friends and relatives of mine attempted to stop me, saying I could not take on Samsung,” said the 58-year-old taxi driver, “and that made me feel really lonely.” He got physically hurt by Samsung, too. When he mounted pickets and protests, the company’s security guards often yanked him off the grounds, roughly. He then criticized the ministry of employment and labor and KCOMWEL—the government agencies purported to protect workers that he believes instead shield the employer from employees’ challenges. What is on his mind six years after he began to fight an undefeatable Samsung? 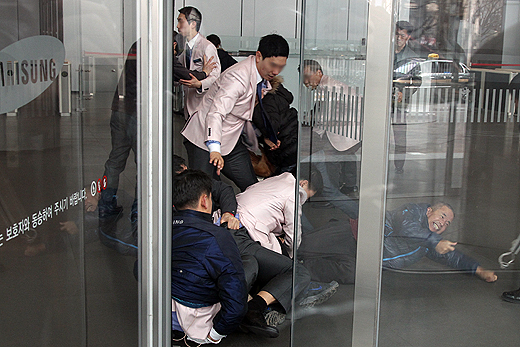 Samsung often responds to non-violent protests with excessive force. The picture was taken on March 9,. 2009 when SHARPS members demanded a meeting with Samsung executives. Mr. Hwang (on the right in the picture) was thrown on to the floor. on June 9, 2014 at 4:24 pm | Reply SHARPS and Samsung Reinitiate Dialogue | stop samsung - no more deaths!